Flower Faeries can be found resting against the stems of flowers, balancing on leaves, swinging from teh branches of trees-in fact, jus tabout anywhere that plants grow. 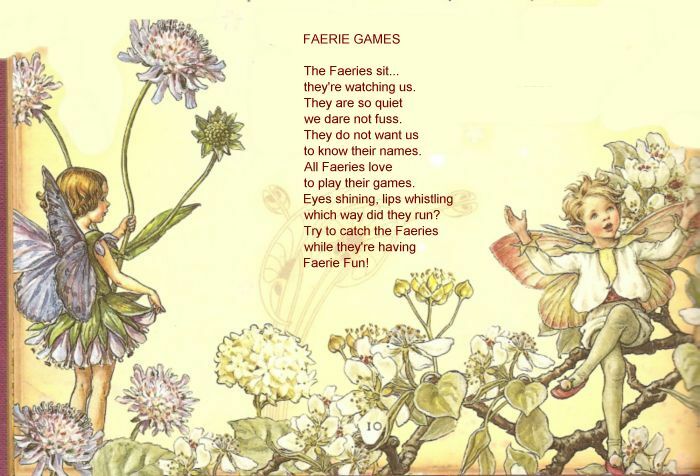 However Faeires are wary of humans, whom they found to be very big and loud, so they always try and hide themselves.Faeries have extra-sensitive ears, so if they hear someone approaching they will quickly flutter into a flower or other handy hiding place and culr up tightly. If you are looking for a faerie, you will have to be very patient and determined, as they are not so easy to find. But remember, the more you know about faeries, the more likely it is that you will see one. This Webpage tells you everything you need to know about the world of the fae so that you will know exactly what to look for. GOOD LUCK!! !